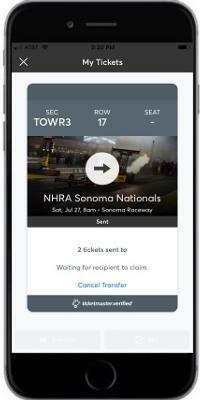 Getting into Sonoma Raceway is simple, seamless and fast with mobile tickets! 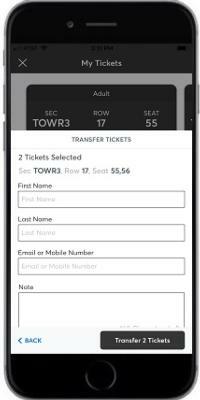 All tickets can be managed from your smartphone. Follow the quick steps below to access your mobile tickets. If you have any questions, please call us at (800) 870-RACE (press 2) or email us at ticketing@sonomaraceway.com. *Passes for items such as camping, parking, Pre-Race, and Thunder Alley are not accessible via a mobile device. Download the Sonoma Raceway app on your smartphone from the App Store or Google Play Store. Select My Account from the 'Sonoma' screen. Login with you Sonoma Raceway account credentials or Ticketmaster.com login. Under My Tickets, find the specific event you’re interested in and select it. Click View Barcode to view your QR Code. 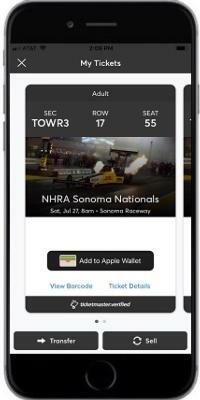 This is the mobile ticket and scannable QR code you'll need to enter Sonoma Raceway. Additional tickets in your set can be viewed by swiping right. If you want to add your tickets to your Apple Wallet or Google Pay, there's a button at the bottom of the screen. Click transfer at the bottom of the screen to begin transfer. Select the seats you'd wish to transfer and press 'Transfer To'. Select your method of transfer. You can select someone from your contacts or enter recipient’s contact info manually. 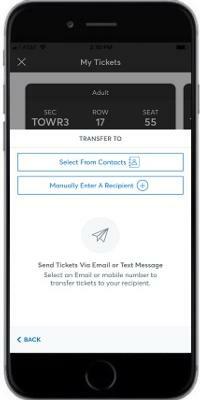 You can transfer tickets via text or email. Fill in recipient’s contact info. Even add a message for them! Then click Transfer Tickets to send the transfer request. You have now initiated the ticket transfer. The recipient now has the option to either accept or decline the offer. You can click Cancel Transfer to rescind your invitation, but only if the recipient hasn’t accepted the tickets yet. Press Sell at the bottom of the screen to start posting. Select the seats you would like to resell and press Set Price. Enter amount you would like to get paid per ticket & press Payment Method. Select how you’d like to be paid at the completion of the sale. The posting price and deposit account are displayed. To finalize the posting press Sell Tickets. Press Edit Posting to change the price of the listing or update the payout method. Press Cancel Posting to remove the listing from the resale marketplace. Once completed, you will receive a confirmation email notifying you that your tickets have been posted for sale. You will also be notified via email when your tickets have been purchased or when your posting has expired. All postings will expire no later than the morning of the race.